Pyr is the capital city of the Fyros people, and the largest city in the currently known parts of Atys. It takes up most of the Imperial Dunes region of the Burning Desert. Pyr was founded in 2483 right after the Fyros first appeared in the Burning Desert. The first bricks of the city of Pyr were laid behind the site where the embalmed body of Emperor Cerakos II was burned on a natural pyre. Pyr is built around a water hole which offers natural fire barriers against kitin invasion, and the pyre now constitutes the main gate of the city. The tribe of the Barkers played a preponderant role in collecting the necessary raw materials for construction of the new capital. 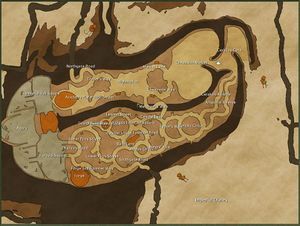 Pyr has remained as the capital of the Fyros and the center from which they oppose their influence on the desert ever since. Unlike the other homin races who have their populations spread out over multiple towns, the Fyros have nearly their entire population living in Pyr, with the 'towns' of Thesos and Dyron being little more than outposts. This makes Pyr in many ways the largest city in the known world, and as such it has suffered far more kitin attacks over the years than any other city, which it's huge walls have so far always helped it withstand. Pyr is the largest known city on Atys, and it's layout is a chaotic maze of streets, squares and buildings that visitors often get lost in. The city can be roughly divided into the market areas taking up the northern side, the residential areas taking up the southern side, and the palace taking up the western end. However, unlike the other capitals, Pyr isn't neatly divided into districts, and the streets of the city are too many to list. This is a list of some of the more important sections of the city. Cerakos Gate : The main gate of the city. Just outside Cerakos gate are one of the city's 3 stables, the city welcomer and the Kitin Observer. Just inside the gate are a tourist guide, a corporal, the Imperial Merchant, the outpost plan trainers, the New Horizon teleporter, and the Kami alter. Cheapside Market : The largest open area inside the city. Cheapside Market holds the market that sells up to quality 50, the cosmetics shops, some trainers, the city's suppliers and a messenger. Highmarket : Highmarket and the surrounding streets hold the market that sells up to quality 150. Northgate Road : The road leading to the northern gate of the city. Just outside the gate are one of the stables and a tourist guide. Merchant's Walk : The one road connecting the northern market areas to the southern residential areas straight through the middle of the city. Oasis Fountain Square : Located in the center of Pyr's southern residential areas, Oasis Fountain Square holds one of the city's messengers, as well as a pretty fountain and the entrance to the bar. Palace : The Imperial Palace takes up the entire western quarter of the city. It's split up into 6 sections, but most activity happens in the central section. This section holds the ambassadors for all the other homin races, the Sage, the Intendant, the Guild Clerk where new guilds can be created, some trainers, and a messenger. In the north of Imperial Hall Square are the Imperial Magistrates who grant Fyros citizenship. The Agora has a stage that is often used for large meetings. Academy : Located in the north of the city in front of the palace. The Pyr Academy holds trainers, the guard chief, a sergeant and a corporal. Forge : Located in the far south of the city in front of the palace. The famous Pyr Forge holds all of the city's overseers, as well as the master Toolmaker. Guardhouse : Located in the center of Pyr's southern residential areas. A corporal and a sergeant post outside the guardhouse. Bar : Located in the center of Pyr's southern residential areas, the bar holds the wheel of fortune. 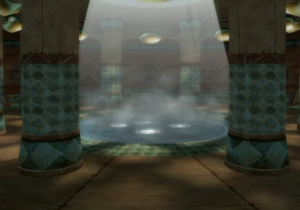 Bathhouse : Located in the center of Pyr's southern residential areas, the bathhouse is a famous place for visitors to relax. Apartments and guild halls are located all throughout the southern residential areas of the city. Guild halls are on Upper Piros Street, Dexton Street, Leanon Street, Fountain Road, Central Lane, and Rydon's Walk. Apartments are on Forge and Hammer Way, Lower Piros Street, Southgate Road, Abylus Circus, Miner's Row, and Coriolis Circus. 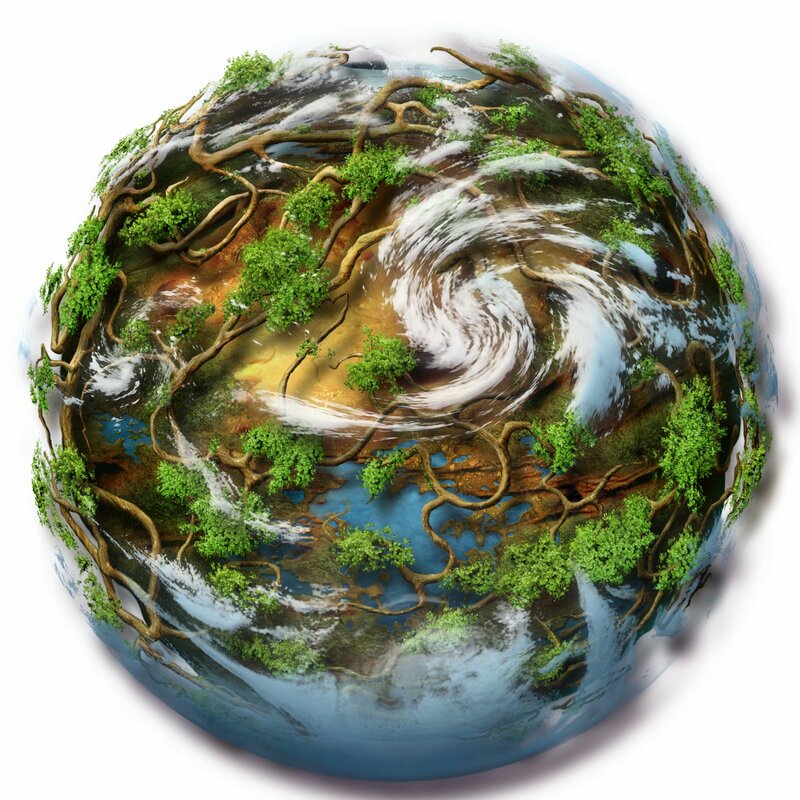 As the largest known city, Pyr naturally has a lot of inhabitants. This is a list of many of the more notable residents. This list can also be found at NPCs of Burning Desert#Pyr. This page was last edited on 12 January 2018, at 17:07.